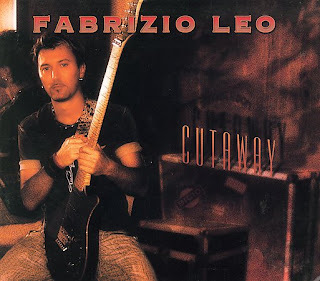 Fabrizio Leo proves that shred guitar need not be confined to the black gothic angst ridden pool of a pentatonic forbidden Hades. Milan's super-shredder conjures compositional emotions of Steve Morse-like exhilaration, sure to please fans of Steve Vai & Tribal Tech alike. If you like Guthrie Govan and Greg Howe as well, be sure to make Fabrizio a vital component of your Progressive-Shred-Fusion diet. Lush arrangements provide the platform for either lightening fast sweeping or long bluesy bends as deemed appropriate. The overall sound is totally Fabrizio's, and his compositions actually take you somewhere as opposed to mere jam tracks provided for fretboard acrobatics. The whole Italian mystique can also be applied to this music-- it's got Lamborghini aerodynamics/power and Armani style. In a previous article on Molinelli Guitars of Milan, my description of their work is nearly identical to the previous sentence LOL;)). So, Milan must have a unique soul which identifies and reflects its artists.